We're back in Buenos Aires after a 6-week adventure that took us from Stockholm, Sweden, to the very southern tip of Italy, and then to Paris (with a one-day side excursion to St. Malo in Normandy). Lots of good food, friendly people, and beautiful sites. We'll post photos here soon. But for now we're nesting. First item on the agenda when we returned Sept. 9 was going through and organizing the contents of those too many boxes from our household shipment that were delivered literally hours before we took off on our trip. Much has been accomplished on that front. However, pending arrival of bookcases and other furniture, books and photos will have to remain in their containers. Second action item: picking up our DNIs (Documento Nacional de Identidad). 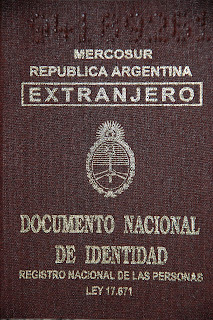 This precious "national identity document" facilitates financial transactions and travel and is solid evidence of our legal status here in Argentina. We picked up the DNIs this afternoon. Gaining them represents the culmination of many steps in the bureaucratic process. It also serves as a milestone: no more paper shuffling until next year, when we renew our temporary residency for another 12 months.